The first reference to Amateur Radio activity in Wolverhampton was located in the Derby Club Archives, dated 1913 when a young Douglas Baker and C Ferrario wrote separately asking how to form a Wireless Club. The November 1919 issue of the Wireless World, announced an inaugural meeting of The Wolverhampton Wireless Telegraph & Telephone Association, Secretary, pro tem, Arthur Lawton, of Essington House, Essington, Nr. Wolverhampton. This information was discovered in the papers of George Jones, who was later to be Secretary of the 1922 Wireless Society. The May 1921, Model Engineer reported the formation of The Wolverhampton Model Engineering & Wireless Club, Secretary Mr A.V. Armstrong who in 1971, was living at the lower end of Coalway Road. He did not remember much about the club, as it had a very short life, and he was not Radio inclined, more of a Model Maker, he did however remember Mr Speaks shop at the bottom of Snow Hill, and his World War 1, surplus gear. The first recorded meeting of the WOLVERHAMPTON WIRELESS SOCIETY, took place on March 1st 1922, organised by George Jones, 2WB, held at the shop of Mr Speke, in King Street. This was not Mr Speke's original shop at the bottom of Snow Hill. Discussions must have taken place over several months, probably soon after the inaugural meeting of the Model Engineering Club, and its subsequent failure. The founding Officers of this new Society, especially the older members were all businessmen. In addition to George Jones and H. Speke, there was F.G. Redhead, who had an Optical and Instrument business in Pipers Row. Mr G.W. Fairall was an Electrical Engineer with the E.C.C. at Bushbury, Harold Taylor 2KQ was a "Wireless Man" and later, if not then, had a shop in the town. Mr George Southwick, who worked in Mr Redheads shop in Pipers Row, remembered a few meetings taking place there. The 1922 Society is considered the founding Society, because of the continuation between that and the following Societies. One of our past presidents, Ernest Gardinier BSc. G6GR, once remarked that few groups to his knowledge, held regular meetings in the pre 1920 period apart from the London Wireless Club, the Derby Wireless Society and a group in Halifax. Also that in the late 1800's and early 1900's, there was little distinction between the Amateur Enthusiast and the Scientific Professional. Searches undertaken during 1971, in the library at RSGB Headquarters, the Wireless World, and Model Engineering at the Birmingham Central Library, plus old Magazines loaned by Frank Merriman G2FPR, and Joe Raby G8RF, records and conversations with Douglas Baker ex ZXS/G2OQ, Felix Singleton ex 5UW, and the papers of the late George Jones 2WB and Bernard Whitehouse G6WF, are used for historical evidence. Committee G.Fairall 2RD, H.Taylor 2KQ, H.Freakley (G8BH), D.Baker	ZXS/2OQ, H.Stevens 5SY, T.Higgs, J.A.H. Devey	5AF. Meetings were to take place on a Wednesday at 7.30 pm, some 24 members were in attendance at the early meetings. Mr Jones 2WB, the secretary at that time lived at 7 Roseberry Street. Meetings were reported by George Jones to the Wireless World and the Model Engineer. Subjects included Wireless Causes and Effects. Demonstrations of "Tuning In", How to JAM, and not to JAM other receivers,	H.F. Amplifiers, Early History of Electricity, .Accumulators, Wireless Simply Explained and the Morse Code. Mr Alf Seabridge, who in 1971 was living in Uplands Avenue, reported that he used to give Morse practice at King St, and later in St Johns Street, as he had been a seagoing operator. Mr E. Blakemore M.I.E.E, senior lecturer at the Science and Technical School, in Garrick Street, was also active with the Society. On March 9th 1922 he commenced a series of 3 lectures ELECTRONIC THEORY. The meeting of April 27th 1922 was a Public Concert and Demonstration, held in the AJS Motor Works Assembly Room. Harry Stevens (Chief Engineer), was chairman for the evening and about 100 people were present. Maud Morgan. Ethel Davis. ElsieTurton. Arnold Devey. Stanley Eaton and John Bourne. The artists were a group of amateur singers, Mrs Devey (Maud Morgan) remembers the evening well, and say's that John Bourne was a writer on the staff of the Express and Star. The concert took place in a large room with a small stage at one end. For the demonstration part of the evening, the singers were taken into a small room in the adjoining works, where they were able to perform in front of a microphone, it is reported that they were clearly heard in the concert room. George Jones continued to report Society activity until the end of August 1922, when he announced in the Model Engineer that he was about to relinquish his secretarial duties, due to pressure of his private business. At the following meeting of the society a vote of thanks was passed, thanking George for his past services and as a founder member. The newly appointed secretary was announced as Mr. J.A.H. Devey (5AF) in the first issue of "Modern Wireless", a copy of which was loaned by Frank Merriman, G2FPR. Further meetings, such as "Tape Recording by Wireless" (Most probably the recording of Morse Signals on paper tape), Station Visits, and Home Construction contests, continued, some were reported by Archie Devey the new secretary, although he was not such a fluent writer as George Jones. Not many reports were printed after mid 1923, then the regular meetings seemed to falter, Mr Redhead, a particular friend of George Jones also probably lost interest following the departure of George, then trade at Mr Spekes shop caused him to move to smaller premises in Bilston St, whilst some meetings did take place there, numbers were dwindling. Although not now a Club member, George Jones was active with Mr E. Blakemore and students of the Wolverhampton Technical School. One particular event was a portable day on Penn Common, two stations were in use, 2WB by George Jones and 6CS by Mr Blakemore. A motor car was supplied to transport the equipment by a Mr Ballard, a member of the class. Dr Fisher, Principle of the Technical school sent an appreciative letter of thanks. This was the beginning of a long association which carried on until Dr Fisher retired in the 1950's. In the late 1920's George Jones turned his interest to Mirror Drum Television, writing numerous articles in the Express and Star. In 1924 Ernest Blakemore AMIEE, left Wolverhampton to take up the post of Principle, at his old college in Horwich, Lancashire, he was presented with a Bookcase by students, staff, and Members of the Radio Society. Mr Benjamin Dunn, of Stafford Road, reported in 1972, that his father was very interested, as a listener, with the Wireless Society. and in the period 1923/4, meeting were taking place at different venues, most attending were "Listeners". One such meeting was held in a public house, in an area known as Cheapside, off North Street, Wolverhampton, about opposite the old town hall. The subject was Telepathy and Wireless, given by Mr Redhead 5GK. One another occasion, his father James Dunn, gave a concert on his English Baritone Concertina, from the station of Harry Stevens, 5SY. By this time, the number of Licensed Transmitters had increased, most of these were business people, and they tended to group together. Meetings continued at Jack Rushtons Shop in Victoria Street. (Radio and Motor Cycles), but gradually the committee changed and eventually the Society its name. The Society call sign G8TA was issued on September 30th 1936. Wolverhampton Amateur Radio Society 1946 One of the earliest Post War meetings of Wolverhampton Amateur Radio enthusiasts, took place at nearby village of Sedgley. This is attributed to Humphrey Nell G2ABB but as Bill Sturmey G8KL lived at Sedgley and was the first Secretary, one would imagine he had suggested the venue. Also present at this meeting was F. Smith G6FK, F. Wyer G8RY, and S. Russ G8UR. Bill shortly moved to No 400 Newhampton Road, Wolverhampton where several committee meetings were held. After the Society settled down the Molineux Hotel was the preferred choice for general meetings, and main lecture meetings at the Central Library, in the large room upstairs which now is the Audio and Video section. The Molineux Hotel at that time was a premier location, most accessible to the town centre, and the Trolley Bus network. Most used this method of transport, or even a "Push Bike". Wolverhampton Centenary Celebrations. The Society supported the Council in its efforts by promoting a week long exhibition of Wireless in the CO-OP Hall's Stafford Street. Mr Elliott, M.I.E.E., borough Electrical Engineer, performed the opening ceremony at 3.30pm on Monday 5th April 1948, in the presence of some 50 visitors. A photo electric device, installed by Jack Rushton G2JZ, recorded 3,000 visitors during the week. One of the most striking exhibits was a HF crystal controlled transmitter with a full 150 watt power amplifier...... by G8RY. Striking because practically all new components were used, it had pride of place at the entrance. The Power Amplifiers section was pictured by the local Express & Star, sadly no photograph remains, however Gordon G4DGM has just recovered a 1948 Newspaper cutting of the complete TX in the G8RY shack. The exhibition was well supported by the trade, such names as AVO, BELLING LEE, DENCO, E.A. WOOD, FENWICK, GPO, HIFI, LABGEAR, R & A, STRATTON & Co, WODEN, were present or supplied equipment. Official visits were paid by the following local Societies...Cannock, Slade, Stoke, Stourbridge, Walsall and Wellington. This page is dedicated to the memory of William C.L. Moorwood G3CAQ ex VU2AQ. 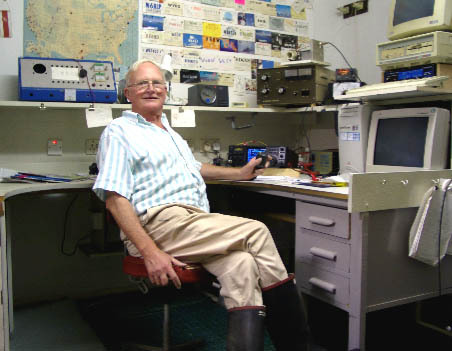 Without the hard work of radio amateurs like Bill much of the history of this fantastic hobby would have been lost. Excerpts of his work are reproduced here with the kind permission of Bill's family. Bill in his "shack" at Codsall. The radio room was inside a barn on a few acres parcel he owned, known by the local hams as "Antenna farm" on a count of the various quad and dipole aerials spread across the pasture. You might have wondered why Bill is pictured wearing wellington boots ! ! Read more about the Wolverhampton Amateur Radio Society and other local Societies and Clubs in Bill's Book "Wireless in the midlands."